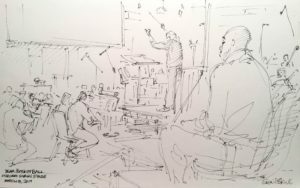 Animator Glen Keane’s sketch of John Williams conducting his Dear Basketball score at the March 2017 recording session. The annual John Williams concerts at the Hollywood Bowl are always cause for celebration, and they remain as popular as ever, generally selling out three consecutive nights on a late-summer weekend. But this year offered a surprise: Williams conducted, live-to-picture, his score for the animated short Dear Basketball, based on Los Angeles Lakers legend Kobe Bryant’s farewell poem to his beloved sport, narrated in person by Bryant himself. I contributed the program notes, as I often do for this concert (co-conducted by David Newman), but this year I also had the opportunity to preview the Dear Basketball premiere (including a new interview with director-animator Glen Keane), and I wrote about the concerts afterward. This entry was posted in Composers, Film Music, Interviews and tagged Dear Basketball, Film Music Society, Glen Keane, Hollywood Bowl, John Williams, Kobe Bryant on September 7, 2017 by Jon Burlingame.